Tour operator Thomas Cook is in talks with three financial services firms, a domestic company and a prominent missionary school to either sell or lease out its heritage head office property in South Mumbai as part of the plans to monetise its real estate in the city. While the names of the financial institutions and the company could not be ascertained, people aware of the development said the “well known school” was talking to Thomas Cook to lease the building to start International Baccalaureate (IB) classes there. IB is a non-profit educational foundation based in Geneva, Switzerland, which offers educational programmes for children aged three to 19. “They (Thomas Cook) have been in talks with three financial institutions and a school for either leasing or selling it,” said a person in the know, who did not want to be named. According to sources, the company is expecting about Rs 25,000 a sq ft in outright sale or around Rs 200 a sq ft in rent for the 50,000-sq-ft building, situated on D N Road in downtown Mumbai. At this rate, the total value of the building works out to be around Rs 125 crore. Built in early 1900s, it is a ground plus four-storey structure in the heritage precinct of Fort area. Thomas Cook is also looking to divest its 15,000-sq-ft property in Nariman Point and a 10,000-sq-ft property in Chembur, sources said, where it is looking at values of Rs 25,000 to Rs 30,000 and Rs 15,000 per sq ft, respectively, for outright sale. 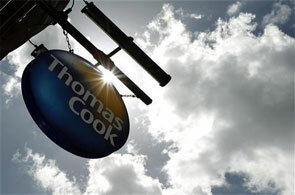 “Thomas Cook has, as part of its strategic intent, consistently evaluated various operating models, which include consolidation of workplaces. In light of the above, we are continuously exploring opportunities that may arise due to changes in the market for this domain, and JLL (Jones Lang LaSalle) is one of the parties that we have been in touch with,” Thomas Cook managing director Madhavan Menon told Business Standard. Realty consultant JLL has been appointed to monetise the properties. Thomas Cook, which is looking to shift its offices to one of the places such as Lower Parel, Dadar, Bandra Kurla Complex or Andheri, is likely to take a decision in the next three to four months, sources said. However, consultants feel it would be challenging for the company to sell the building at these rates, given the market conditions. Thomas Cook may have to secure approval of the Municipal Corporation of Greater Mumbai for selling the building as it is a lessee of the civic body. According to realty consultant Cushman and Wakefield, the net absorption of office spaces has come down by 38 per cent at 3.6 million sq ft in top eight cities, including Mumbai, in the first quarter of 2013. But a number of large corporations are shifting to western and central suburbs of Mumbai to cater to their growing workforce and monetise their properties in south Mumbai, which is one of the expensive real estate markets in the world where residential prices have touched Rs 100,000 a sq ft. Recently, Cadbury India had put its iconic Cadbury House on the block and is looking to shift out to Thane, on the outskirts of Mumbai, to accommodate its growing staff base. Some years ago, consumer goods company Hindustan Unilver Ltd (HUL) moved from Lever House in South Mumbai to its new campus in Andheri East in the western suburb of Mumbai. Last year, HUL leased out the 150,000-sq-ft Lever House to mortgage lender Housing Development Finance Corp for an undisclosed sum. It also sold its former training house Gulita to the Ajay Piramal group for over Rs 450 crore (Rs 4.5 billion).